Although Kathmandu doesn’t lie in the geographical centre of Nepal, everything west of the capital is considered to be Western Nepal; anything west of Pokhara is considered Far Western. And Far Western Nepal is very remote, wild, and difficult to access. But all of that just adds to the adventure of trekking there! Far Western Nepal is home to some of the most incredible rivers, lakes and landscapes in the country. It would be hard to trek for days without seeing another person in other parts of the country, but this is possible in Far Western Nepal. Imagine what popular regions like the Khumbu, Annapurnas and Mustang were like before they became popular with trekkers, and you have Far Western Nepal. Treks in the Far West require quite a bit of logistical planning because of limited road connections to trailheads, the necessity of flying to small mountain airstrips from cities on the Terai, and sometimes because of special permits (which can be costly). And, in some areas, it’s necessary to take all food supplies in with you, as you can’t rely on buying supplies from locals or sitting down to prepared meals in teahouses. Trekking in the Far West should only really be attempted by seasoned trekkers, preferable with a bit of Himalayan experience—this is not the place to head if you’re a beginner wanting a quick introduction to trekking in Nepal. But, if you know what you’re getting into, the Far West is perhaps the most rewarding area of Nepal to spend some time. The Dolpo region is divided into Lower and Upper Dolpo. While Upper Dolpo requires an expensive permit to visit (US$500 for 10 days), Lower Dolpo doesn’t. 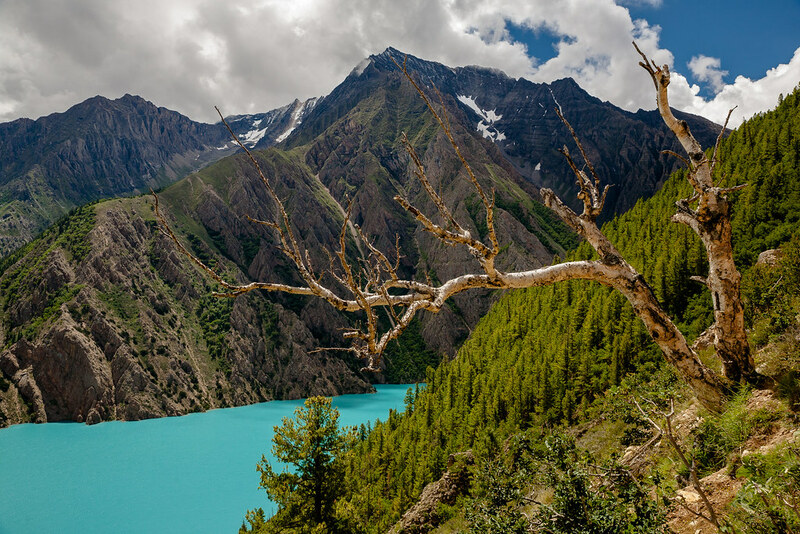 The main attraction of Lower Dolpo is the Shey Phoksundo National Park, and Lake Phoksundo within it. 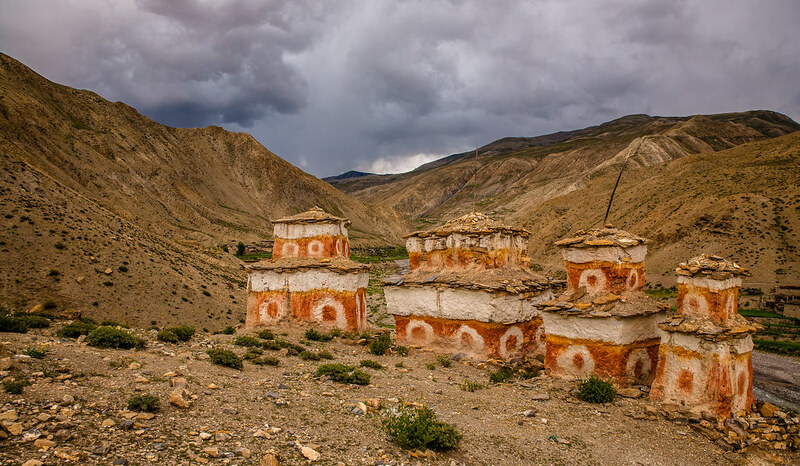 Upper Dolpo, in contrast, lies within the rain-shadow of the Himalaya, meaning that the landscape is dry and harsh. The locals are descended from the Tibetans who used to cross here to trade, and their language, religion and culture is still very Tibetan in influence. Reaching the trailhead for the Lower Dolpo trek requires two flights from Kathmandu, first to Nepalgunj and then to Juphal. The landscape is very varied, with river valleys, high alpine pastures, two high passes to cross, and the final destination, beautiful Lake Phoksundo, in the Shey Phoksundo National Park. On the way there are great views of the Dhaulagiri Range to the east and Kagmara Range to the west. An interesting part of this trek is the encounter with the pre-Buddhist Bon religion. Some small communities in Nepal still practice this religion, and on the Lower Dolpo trek there’s the chance to visit a Bon monastery. The Upper Dolpo trek is one of the harder and longer treks in Nepal, with several camps above 4500 metres and some high passes. Organised tours are essential, as there is virtually no tourism infrastructure here. As with the Lower Dolpo trek, this one begins with a flight to Juphal, and a trek to Lake Phoksundo. Past this, high snowy passes, hidden valleys, the Shey Gomba monastery, and many fortified villages await. Virtually everyone who makes the effort to trek here finds it to be an incredible experience. 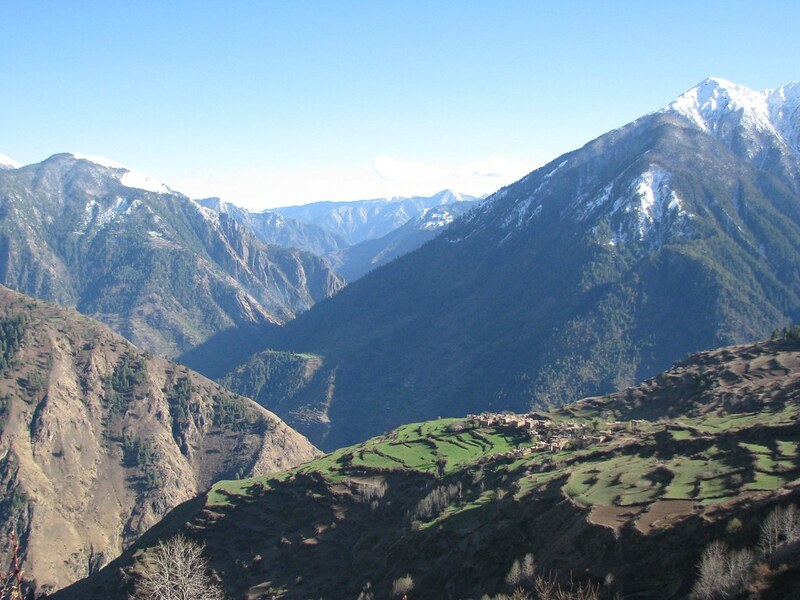 Acclimatisation days and contingency days are built into itineraries to Upper Dolpo. Flights are often delayed or cancelled, and some members of the party may need to take some parts slowly. If you don’t encounter any delays, these extra days can be spent on side trips. 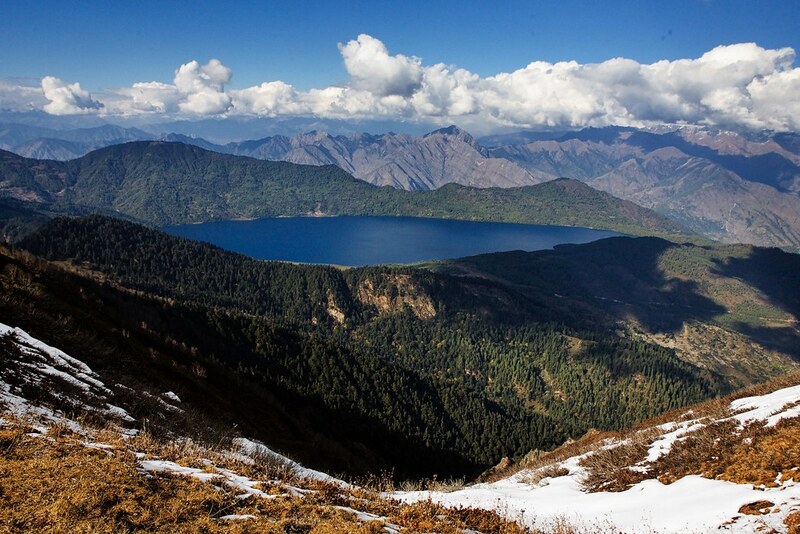 Rara Lake is the highest and deepest lake in Nepal, and is called the Queen of Lakes. The Rara National Park, in which it lies, is a beautiful protected area, famous for its abundant bird life around the lake, as well as wildlife such as musk deer, Himalayan black bears, leopards and Himalayan ghoral. 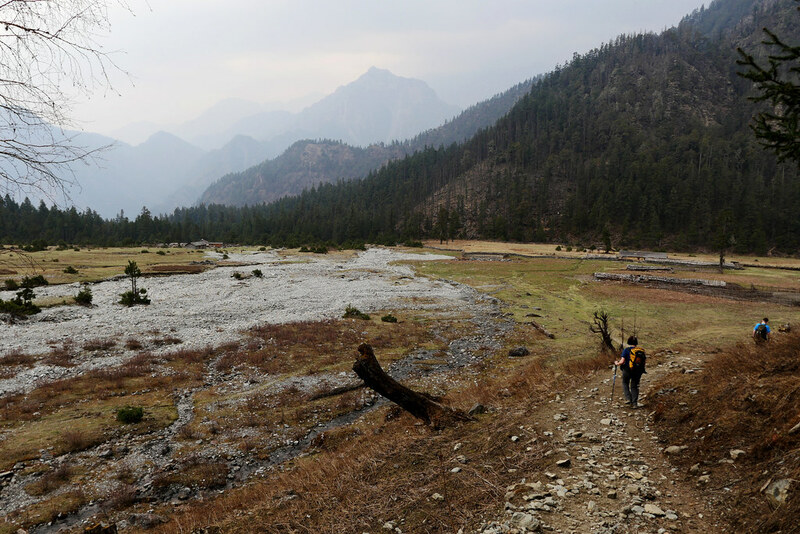 Trekking here allows visitors to pass through some of the best-preserved wildlife habitats in the country. The Rara Lake Trek starts and ends with a flight to Jumla, from Nepalgunj. This trek is moderately easy as the altitude does not climb too high (to around 3000 metres). The Dhorpatan trek is extremely off the beaten path—only around 100 foreigners visit each year! But, unlike most of Western Nepal is not highly challenging. Dhorpatan is Nepal’s only hunting reserve, and hunting of certain species is only allowed in some areas, but the wildlife isn’t isolated to those areas. Dhorpatan has many blue sheep, ghoral, Himalayan tahr, partridges and pheasants, including the Danphe, Nepal’s colourful national bird that looks a bit like a peacock. You may even get lucky and see a snow leopard. The mountain views are also incredible, as Dhorpatan lies to the west of Dhaulagiri, the eighth-highest peak in the world. Dhorpatan is about a day’s drive west of Pokhara, so is relatively accessible. 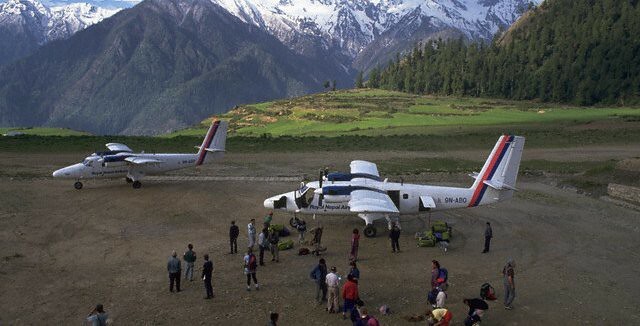 The remote Humla and Limi Valley trek starts with flights to Nepalgunj and Simikot (the latter just a mountain airstrip). It starts by following the Karnali River, which runs from Tibet, and primarily keeps to the ancient salt route to/from Tibet. Several 4000-metre-plus passes must be crossed, and for a couple of days you will walk without encountering any villages. The Limi Valley is still culturally connected to Tibet, and the local people even still trade with Tibet. The Tibetan culture and lifestyle in the villages of Halji, Til and Jang are highlights of this remote trek. You’ll find an 800-year-old monastery, plenty of blue sheep and maybe even an elusive snow leopard. Incredible views of mountains in Nepal and Tibet, including holy Kailash (6714m), await near the end. This route is very seldom trekked, so extra special preparations are required. From Nepalgunj, fly to the mountain airstrip at Jumla. Head to the Rara National Park, then west towards the Karnali River. Reach Simikot, headquarters of Humla district, then take a detour to Yari, a small town very near the border with Tibet, with only a pass separating Nepal from China. The walk to and from Yari passes through orchards, fields of crops and up a steep ravine. Discover all of our hand-picked hiking trips in the regions of Nepal and other Nepalese adventures. If you’re not where you want to go, or what you want to do, check out our guide.